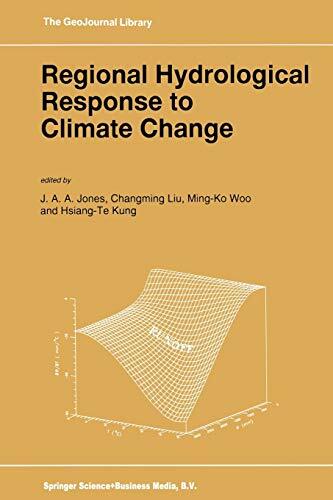 This volume arises from the work of the International Geographical Union Working Group on Regional Hydrological Response to Climate Change and Global Warming under the chairmanship of Professor Changming Liu (1992-96). The book consists mostly of peer-reviewed papers delivered at the Working Group's first three scientific meetings held in Washington, D.C. (1992), Lhasa, Tibet (1993) and Moscow (1995). These have been supplemented by a few additional chapters that have been specifically commissioned in order to give a well-rounded coverage of the global and scientific aspects of the topic. As editors, we have sought to balance state-of-the-art reviews of methodology and regional research with detailed studies of specific countries and river basins. In the spirit of the IGU, we have devoted particular effort to encouraging contributions from scientists in the non-English-speaking world. These chapters provide valuable evidence of recent climatic change and predictions of future hydrological impacts from parts of the world where little detailed work has been conducted hitherto. They provide much valuable information that is new and interesting to an international audience and is otherwise very difficult or impossible to acquire. It is hoped that the present volume will be not only a record of current achievements, but also a stimulus to further hydrological research as the detail and spatial resolution of Global Climate Models improves. One notable aspect that emerges from a number of the contributions is that many, though by no means all, recent hydrological trends are in line with global warming predictions.